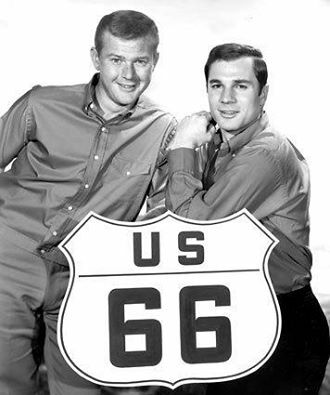 <—MARTIN MILNER (with George Maharis) is best known for starring in two popular television series: Route 66, which aired on CBS from 1960 to 1964, and Adam-12, which aired on NBC from 1968 to 1975. Milner had his first screen test and began his career with his debut in Life with Father, in the role of John, the second oldest son of Clarence Day played by William Powell. Two weeks after production ended in 1946, Milner contracted polio. He recovered within a year. He landed a small role in Sands of Iwo Jima starring John Wayne. It was the first of several war films in which he would have both minor and major roles in the 1950s, including another Wayne picture called Operation Pacific in 1951, and Mister Roberts with Henry Fonda, James Cagney, Bill Powell (again), and Jack Lemmon. Other notable performances were in Sweet Smell of Success, Pete Kelly’s Blues, Dial M for Murder, The Long Gray Line, Gunfight at the OK Corral, Francis in the Navy, Desk Set, Too Much Too Soon, Valley of the Dolls, and 13 Ghosts. It was on the set of Halls of Montezuma in 1950 that he met actor Jack Webb. In 1952, Milner began a two-year stint in the United States Army. He was assigned to Fort Ord on California’s Monterey Bay peninsula, where he directed training films. Milner was encouraged by fellow soldier Clint Eastwood to pursue an acting career when his time in the military ended. While serving, Milner began working for Webb, playing Officer Bill Lockwood (briefly as the partner of Sgt. Friday) and other characters on the Dragnet radio series. He also appeared on six episodes of Webb’s Dragnet television series between 1952 and 1955. He guest-starred on television programs, including a recurring part in The Life of Riley, The Twilight Zone, and Rawhide. Milner won the role of Tod Stiles in the CBS television series, Route 66. 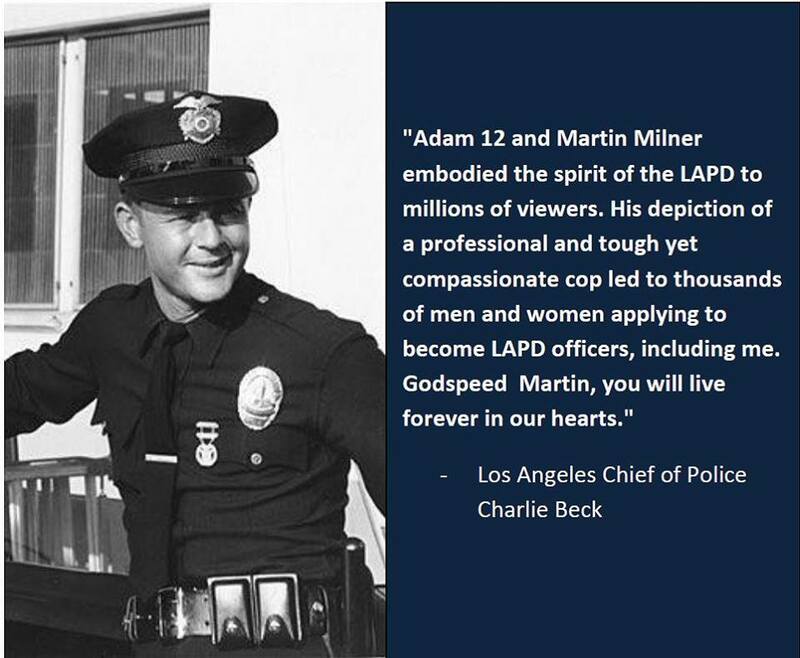 His ongoing relationship with Jack Webb led to his eventual signature performance as Pete Malloy in Adam-12. Milner appeared in three episodes of Emergency! between 1972-1976, during and after Adam-12′s run on NBC. Milner also has the distinction of having portrayed the victim in the premiere episode of Columbo. After retiring from acting, Milner co-hosted a radio show about fishing called Let’s Talk Hook-Up on XTRA 690. This entry was posted on Monday, September 7th, 2015 at 5:29 pm	and is filed under Blog by Manny Pacheco. You can follow any comments to this post through the RSS 2.0 feed. Responses are currently closed, but you can trackback from your own site.